Fall is here. For me, that means it was actually cool enough to take the "kids" (ahem, still weird I have two now) on a walk this morning. It's still supposed to pass 100 for a little while but I'm happy that it's cooling down in the morning and at night. Soon I'll break out my "winter clothes"- jeans and a long sleeve t shirt, maybe even a cardigan- that have been hanging in the desolate outreaches of my closet. 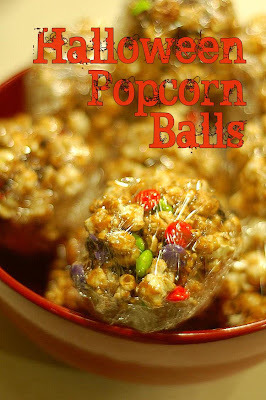 So with fall officially here, I thought it would be fun to make popcorn balls. We had some Halloween M&Ms that we had to buy since they were predominately orange- my son's absolute favorite color. We mixed them into a few of the balls and they were cute and festive. If you do that, I'd recommend carefully folding them in after you mix the popcorn and caramel together so they don't start to melt and get crushed. Regardless, it still tasted great. Chocolate chips or other little candies would also be really cute in these. If you could shape the balls while they were still a little warm, you could also roll them in sprinkles for another cute touch. I got this recipe from a friend in Utah a few years ago. She'd brought these to a party and they flew off the table- seriously. Every time I make these I wonder why I make them so rarely. Then I remember- it's because I don't want to have a heart attack before I hit 30. That said, they are crazy delicious- flavorful, soft and chewy, feature only pantry staples so it's no problem to whip them up, simple enough that my two year old helped out, and (on occasion) totally worth the calories. Go go! Combine all ingredients in a large saucepan and, stirring occasionally, bring to a rolling boil. Boil for 5 1/2 minutes, stirring just about constantly, being careful to scrape the bottom of the pan so it doesn't burn (I like to use a large silicone spatula). Be careful- the caramel is extremely hot! Let cool for one minute then pour over popcorn (see below). Stir to combine and shape into balls once it's cool to the touch. These are so cute and festive! My kids are popcorn addicts (me too! ), they would love these! Btw...I absolutely love your quote in the header! I have a bag of popcorn that needs popping. I'll have to make these. My kids love popcorn balls but I hate the store bought ones because they taste like styrofoam. When you specify a "cube of butter", exactly how much do you mean? It looks delicious. Popcorn balls are a great Halloween treat. Weird question, is Eagle brand milk sweetened condensed milk or evaporated milk? I figured it could make a big difference. Alyson- It's sweetened condensed milk. Not a weird question at all, I'll try to remember to specify next time!